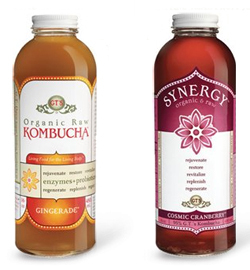 Whole Foods is pulling the fermented tea known as kombucha off its shelves, according to the Associated Press. And it's not because the yeasty bacterial tendrils swimming about in this beverage, to which some attribute magical properties, make it look like a Snapple that's been sneezed into all day. No, apparently the fermentation process can produce alcohol, and any beverage that's more than .5 percent hooch must carry a government warning. The booze component might help explain some rumored side effects, like lowered anxiety and cure for insomnia, but it doesn't account for supposed healing effects the drink has on sweaty feet, balding, diarrhea and AIDS. Jury's still out on that stuff.